“Corn sugar”? It’s high-fructose corn syrup by any other name, and it’s dangerous. 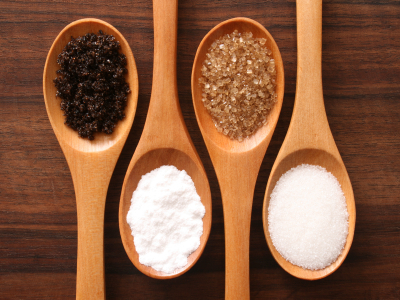 What sweeteners are safe? What’s not? You may be surprised at the latest research. The website was created by the Center for Consumer Freedom, a lobby begun with $600,000 from the Philip Morris tobacco company, and is sponsored by restaurant and food companies like Arby’s, Tyson Foods, HMSHost Corp, and Wendy’s. So much for impartiality. High-fructose corn syrup is a corn syrup that has undergone enzymatic processing to convert some of its glucose into fructose to produce a desired level of sweetness. But because of its processing, some brands of HFCS may contain mercury, a known neurotoxin. Moreover, many studies have indicated that it suppresses the sensation of being full, causing people to eat more of it. Rats fed HFCS developed fatty liver disease and type 2 diabetes, while those on a fructose-free diet did not. And when they were given a high-fat diet, they gained more weight than those who had been on a fructose-free diet. Other studies suggest that HFCS directly causes obesity. (Of course, the American Medical Association and the American Dietetic Association side with the Corn Refiners Association in thumbing their nose at the mountain of evidence.) HFCS also causes cardiovascular disease, even in children and adolescents. And the American Society of Nephrology found that HFCS causes high blood pressure as well. Fructose is commonly thought of as “fruit sugar,” but fruit also contains glucose—and fiber, sometimes a great deal of it, not to mention other nutrients. But studies indicate that fructose, processed and stripped of its co-factors, causes metabolic syndrome in animals. The metabolic processes involved in the breakdown of fructose can lead to a buildup of uric acid—which is a risk factor for cardiovascular disease. Fructose can raise blood triglyceride levels, which can trigger atherosclerosis, increases fat deposits around the viscera, and decreases insulin sensitivity in overweight people. Cancer cells thrive on sugars, particularly fructose. It has been demonstrated that cancer cells actually metabolize glucose and fructose differently from other cells. While cancer thrives on both, it uses fructose specifically to proliferate. It’s no wonder that cancer has moved quickly up the list of killers in our society since we started adding high-fructose corn syrup to everything from sodas to bread. With such damning and irrefutable research, I still don’t understand why it hasn’t become standard practice to immediately put cancer patients on fructose-free diets to help disrupt cancer growth. Agave, which is derived from the agave cactus (which also produces tequila), sounds like an ideal alternative, but some health advocates like Dr. Joseph Mercola have some serious concerns about it, and say its acceptance is the result of deceptive marketing. They say that most of the agave sweeteners you find on supermarket shelves are not natural products and are not organic. What is clear is that it is not low-calorie and does not have a low glycemic index. It is 50% to 90% fructose. All this has led many people to go back to “good old sugar.” But is that wise? Sugar is an ingredient in 70% of manufactured food, according to The Economist. But sugar and simple carbs (refined grains, high-fructose corn syrup, etc.) may adversely affect blood lipids, according to the Journal of the American Medical Association, increasing your risk for heart disease and stroke through fat accumulation, metabolic syndrome, obesity, premature aging, and type 2 diabetes. Sugar molecules bond with proteins to create AGEs (advanced glycation end-products)—which can wreak havoc on blood vessels, including those of the heart and kidneys. AGEs appear to be responsible for many of the long-term complications of diabetes. George Mason University professor of economics Walter E. Williams points to powerful sugar companies whose massive political donations—millions of dollars to both parties—ensure that Congress keeps tariffs high on foreign sugar so the US sugar industry can charge higher prices. According to one study, one politically connected sugar-manufacturing family alone earns about $65 million a year from congressional protectionism. The Archer Daniels Midland company makes similarly huge donations, because higher sugar prices benefit ADM, who produces corn syrup (fructose), which is a sugar substitute. When sugar prices are high, sugar users (soda, candy, and food processors) turn to corn syrup as a cheaper substitute sweetener. What about artificial sweeteners, then? Surely they’re better for you than sugar! Aspartame (Equal and NutraSweet), which is used in more than 6,000 diet products, beverages, and pharmaceuticals, has remained a battleground. Despite FDA officials describing aspartame as “one of the most thoroughly tested and studied food additives the agency has ever approved” and its safety as “clear cut,” in March 2006, Environmental Health Perspectives (from the National Institutes of Health) published the first compelling experimental evidence for the carcinogenic effects of aspartame at a dose level within range of human daily intake. A second animal study by the same research team now indicates that the carcinogenic effects of aspartame are magnified when exposure begins during fetal life. One packet of Equal contains 33 mg. of aspartame; one can of Diet Coke (355 ml.) contains 131 mg. of aspartame; and one-half cup of Jello Light contains 40 mg. of aspartame, according to the Canadian Diabetes Association. A 44-pound (20-kg.) child would only have to consume 400 mg., about the equivalent of three Diet Cokes per day, to reach the carcinogenic 20 mg./kg. bodyweight dose. Jonathan V. Wright, MD (who contributed last week’s article on antioxidants), notes that 10% of aspartame is methanol, which is converted to formaldehyde which, in turn, is converted to formic acid—which is used to strip epoxy! The other 90% is composed of phenylalanine and aspartic acid. These amino acids are normally harmless, but in isolation they are neurotoxic. He also revealed in the August 2009 issue of his Nutrition and Healing newsletter that aspartame decreases the availability of tryptophan and reduces the brain’s level of serotonin. Diet Coke contains aspartame. Yet in 1985, as a member of the National Soft Drink Association, Coca-Cola opposed the FDA approval of aspartame for beverages. The company’s own objections—running to several pages in the Congressional Record—included the assertion that aspartame is uniquely and inherently unstable and breaks down in the can. It decomposes into formaldehyde, methyl alcohol, formic acid, diketopiperazine, and other toxins. In a study on seven monkeys, five had grand mal seizures and one died, a casualty rate of 86%. Aspartame is another glaring example of crony capitalism at work. The sweetener was discovered in 1965 by the G.D. Searle chemical company. In 1980 an FDA Board of Inquiry comprised of three independent scientists confirmed that aspartame “might induce brain tumors” and banned it. On January 21, 1981, the day after Ronald Reagan’s inauguration, Searle re-applied to the FDA for approval to use aspartame in food sweetener, and Reagan’s new FDA commissioner, Arthur Hayes Hull, Jr., appointed a five-person Scientific Commission to review the Board of Inquiry’s decision. It soon became clear that the panel would uphold the ban by a 3-to-2 decision, but Hull installed a sixth member on the commission, and the vote became deadlocked. He then personally broke the tie in aspartame’s favor. Hull later left the FDA under allegations of impropriety, served briefly as Provost at New York Medical College, then took a position with Burston-Marsteller, the chief public relations firm for both Monsanto and G.D. Searle. Searle was purchased by Monsanto in 1985. Neotame is a version of aspartame made by NutraSweet which is between 7,000 and 13,000 times sweeter than table sugar and 30 to 60 times sweeter than aspartame. It was approved by the FDA in 2002. According to Dr. Mercola, “Judging by the chemicals used in its manufacturing, it appears even more toxic than aspartame, although the proponents of neotame claim that increased toxicity is not a concern, because less of it is needed to achieve the desired effect.” It is chemically very similar to aspartame but with the addition of 3-dimethylbutyl, which is listed on the EPA’s most hazardous chemical list. While it is not currently in wide use, it is attractive to food manufacturers for two reasons: it would greatly lower the cost of production compared to using sugar or high fructose corn syrup due to the lower quantities needed to achieve the same sweetening; and it is approved for use in a wider array of food products, including baked goods, because it is more stable at higher temperatures. Saccharin (marketed as Sweet’N Lo), which is much sweeter than sucrose but has a bitter or metallic aftertaste in high concentrations, became mired in controversy in 1977, when a study indicated that the substance might contribute to bladder cancer in rats. But in 2000, the chemical was officially removed from the federal government’s list of suspected carcinogens once scientists learned that rodents have high pH, high calcium, and high protein levels in their urine, and this combines with saccharine to cause tumors. As this does not happen in humans, there is no elevated bladder cancer risk, so it appears to be one of the safer artificial sweeteners. However, it still contributes to obesity and even the development of type 2 diabetes, despite its lack of calories. The reason, as Science News points out, is that there are taste cells in the stomach, intestine and, evidence suggests, the pancreas, colon and esophagus. When the taste sensors in the gut encounter something sweet, they send a “prepare for fuel” message that results in cranked-up insulin levels in the blood. This, in turn, causes sugar cravings, and the cycle keeps repeating. This means that even no-calorie sweeteners like saccharine can trigger the release of insulin and cause weight gain—all because of their sweet taste. Bearing in mind what we noted above, that all sweet tastes raise insulin, which causes overeating and sets the stage for type 2 diabetes, there are some alternatives you might consider. Stevia is a South American herb that is estimated to be some 150 to 400 times sweeter than sugar. Since the mid-1980s, the FDA has labeled stevia as an “unsafe food additive” and has gone to extensive lengths to keep it off the US market—including initiating a search-and-seizure campaign and full-fledged “import alert”—despite the fact it has been used by millions of people around the world, in some locales for hundreds of years, with no ill effects. So adamant has the FDA remained on the subject that even though stevia can now be legally marketed as a dietary supplement under legislation enacted in 1994, any mention of its possible use as a sweetener or tea was strictly prohibited—that is, until 2007, when Coca-Cola announced plans to obtain approval for their stevia-derived sweetener, Rebiana, for use as a food additive. FDA approved it in 2008. Coca-Cola announced intentions to release stevia-sweetened beverages shortly thereafter. Sugar alcohols like xylitol and erythritol seem to be safe, though some people find that xylitol has a laxative effect. Xylitol was originally isolated from birch sap. Erythritol occurs naturally in fruits and fermented foods. And Xylitol, used as mouth rinse, prevents cavities very effectively. It is especially good for children, particularly those who have not had their teeth treated with a tooth sealant that contains BPA. Inulin, which is isolated from Jerusalem artichoke, is available as a powder or as Jerusalem artichoke syrup. Inulin is a long-chain polysaccharide that is mostly too long a sugar to absorb into the blood stream, though too much inulin intake can cause digestive distress in some people. Honey (raw, organic) is always the natural sweetener of choice. Look for wild honey because it is lower in free fructose and higher in trace mineral content, especially the richer dark varieties. Maple syrup is the only sustainably-harvested, large-scale, forest sweetener in the world. Maple is one of the richest source of minerals found in any sweetener. Look for organic maple syrup and maple crystals as an ingredient. Unsulfured, organic sugarcane molasses is fairly rich in vitamins and minerals and has been purported (like fresh sugar cane) to have “anti-stiffness factors” that break down detrimental calcification. Lo Han Guo is a non-glycemic sweetener made from a type of wild cucumber. It is used in Traditional Chinese Medicine to treat cough and laryngitis.